Being on a budget doesn’t mean you need to forego healthy eating or competition dieting to obtain the body you want. Yes— it is still possible to stick to a clean, healthy and nutritious diet that is fit for achieving your fitness goals, even if you are strapped for cash. The fact is, eating clean is no more expensive than following a regular diet, especially if you have a plan of action. It really shouldn’t even be a consideration; eating healthy, whole food now is important to your health later in life. It may seem cheaper to go for a processed food item, but remember— processed food is not rich in nutrients, vitamins or minerals, and is full of ingredients like refined sugars and chemicals that could cause distress to your health further down the road. First off, you may want to consider where you are shopping. If it is at a specialty grocery store, the prices will almost always be higher than a regular supermarket. For more ways to save on healthy diet foods— and get the most from your food while still achieving your fitness goals— try these five tips. Shop in Bulk and Be Consistent. One of the benefits of following a diet plan is that there is usually not too much variety. Generally speaking, you will always require the same types of food items on a regular basis, so why not buy in bulk? Consistency is the key to successful dieting, and although it may seem expensive at first, over time you will be spending less per serving of food. Good items to buy in bulk are whole grains such as oatmeal, quinoa, chia, rice, nuts, nut butters, and oils, while items like meat and egg whites can be frozen for use later. Buy Frozen. Nowadays, frozen vegetables and fruit retain their nutritional value after freezing, so there really is no reason not to buy them! They also save you prep time and money. Frozen fruit can be added to a shake, while mixed frozen veggies are the perfect side dish to your protein or for a quick stir fry. There are also lots of great frozen fruit and veggie options that can add some spice to your cooking— you can now buy mixes of frozen super berries, Asian style veggies mixes, or even frozen grilled veggies! Plan Your Meals Ahead of Time. By planning your meals weekly, you can be sure you are not wasting any food. Plan out your breakfast, lunch, dinner and your snacks to make sure you know exactly what you need. Rotate between one or two simple meal plans, week after week. 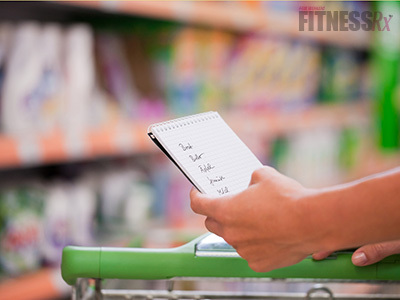 Make a list before you go to the grocery store and stick to it! Not only will planning keep you on your diet, but it will also ensure you are not buying extra food you don’t need. Portion Control. Although this should be obvious, eating less automatically equals less food and less cost. Keeping your portions in check will also ensure you are sticking to your diet plan. Be sure to measure and weigh all your food to keep your portions under control. Switch Up Your Proteins. You don’t always have to eat a piece of meat to get your protein in! Beans and legumes are a great protein option, can be bought in bulk, and are extremely inexpensive on a per serving basis. Egg whites and canned tuna are two other great protein options that are less expensive than meat options, and are fairly versatile. Lastly, you don’t have to eat the best cuts of meat to ensure you get the protein you need; choose less expensive cuts of meat and the occasional ground meat as an option. Wedding Cake or Protein Bar?